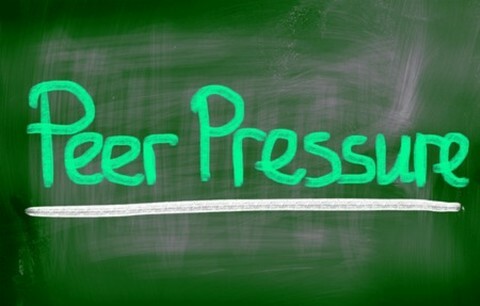 People can experience peer pressure at any age; however, for teenagers it can be especially more difficult. The teen years are a time of change—spiritually finding what you really believe about God, emotionally realizing the power of feelings, and physically changing every day. Throwing on pressure from your peers is like adding fire to a gasoline! Yet keep in mind that God will never leave you even in times of temptation. He has all power to help you overcome what seems like the most impossible of situations. In fact, the Lord promises to make a way for you to escape when you are tempted. The best defense against peer pressure is a great offense. Try to P-U-S-H B-A-C-K and experience the best teen years yet! We are weakest in dealing with peer pressure when we are so busy looking at others instead of looking towards God. Our vision is short-sighted because God is the source of your strength to stand up for yourself as a soldier of Christ. Take the time to seek after the Lord every day and He will renew your resolve to step away from bad influences. It’s so easy to judge the person or people causing us drama. Yet whenever there’s smoke—there’s fire! Satan is the father of all lies and he seeks to steal our joy, kill our desires, and destroy our dreams. Pray against the spiritual powers that use people to draw your heart away from God. Have you ever heard of the saying “If you stand for nothing, you’ll fall for anything”? Standing up for what is right may result in persecution from those around you. Friends may drop like flies in bug spray yet when the mist clears—you will be standing with your integrity, reputation, and future. God has called you to be a warrior for righteousness. The desire to get revenge runs within the hearts of many people. We want justice right away and in our own way. The key to holding off the desire for revenge is recognizing it in your heart and confessing it to God. The Lord will repay evil in His all-knowing “how-to-get-you-real-good” way. The best defense against peer pressure is a great offense. Try to P-U-S-H B-A-C-K and experience the best teen years yet! Nothing happens to you without God’s foreknowledge. He knows what you are pressured to do. The Lord allows these temptations to grow you up spiritually so that you can be a wiser and stronger Christian. God stretches you so that He can bless you in ways that you could’ve never imagined before. “Do not think of yourself more highly than you ought, but rather think of yourself with sober judgment, in accordance with the faith God has distributed to each of you” (Romans 12:3). Sometimes when dealing with peer pressure you may be surprised when other Christians fall under the temptation to please people more than pleasing God. It’s tempting to judge them as weak and yourself as strong. Perhaps it’s better to accept that God has graciously given you a greater measure of faith. It may be that those friends’ faith may be strengthened when you set the example of following Christ. It’s difficult to find your way around an unfamiliar place when the lights are out. However, you can easily make it from one room to the other when the light switch is on. When you take the time to read and memorize God’s word every day, the knowledge and application of it will lead you through the difficult times of peer pressure. The Lord speaks plainly and clearly through the Bible for those who really want to hear from Him. It sounds simple to “have faith in God” but sometimes it’s harder to live out especially when you feel the heat to conform to the ways of the world. Faith is a precious gift that not everyone can receive. It’s believing and trusting in God even though everything around you is saying “you are all alone in this”. God is with you and He’s moving in your behalf even when you don’t see it, feel it, or touch it. He’s going to get you through it in victory. Push Back on Peer Pressure! “Don’t let anyone look down on you because you are young, but set an example for the believers in speech, in conduct, in love, in faith and in purity” (1 Timothy 4:12). Your physical age doesn’t dictate your spiritual maturity. When you desire with all your heart to follow after Christ, He will allow you to go through big pressures so that you will be a stronger Christian and warrior for the kingdom of God. With the help of the Holy Spirit, stand firm in the faith and never give in. Always looking for new things to study to increase my faith and prayer life. At times I am asked to teach a group of children at church so like today I looked at your article on Peer Pressure which I will speak to the preteens tomorrow evening. The article is very informative.